Ambassador Andrew Young | HOPE Global Forums | Presented by Operation HOPE, Inc. 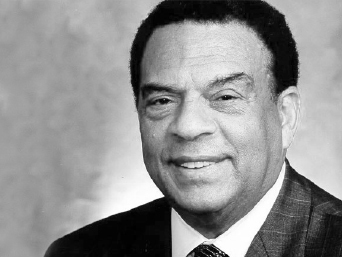 Ambassador Andrew Young is Chair of the Andrew J. Young Foundation. He was a key confidant and strategist to Dr. Martin Luther King, Jr. during the critical years of the civil rights movement. In 1972 he was elected to represent Georgia’s 5th district, the first African-American elected from the South since Reconstruction. He was appointed by President Jimmy Carter to serve as the U.S. Ambassador to the United Nations, the first African-American to do so. In that role, Ambassador Young established the framework for international negotiations that led to democracy in several nations in Southern Africa. Ambassador Young has received honorary degrees from more than 100 universities and colleges in the U.S. and abroad. His many awards include the Presidential Medal of Freedom, the NAACP’s Springarn Medal and France’s Legion d’honneur, the nation’s greatest honor. He serves on a number of boards including: the Martin Luther King Center for Non-Violent Social Change; the United Nations Foundation; Morehouse College and the Andrew Young School for Policy Studies at Georgia State University.